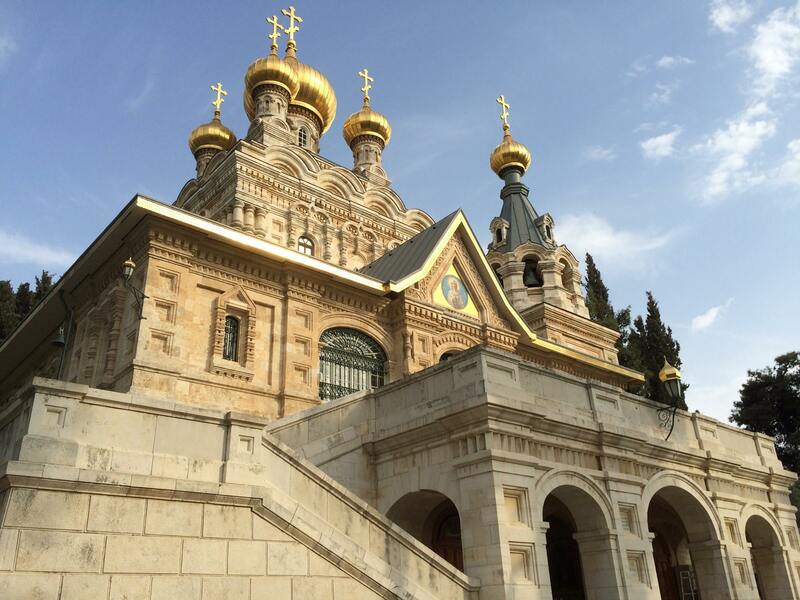 The Russian Orthodox have the monastery of St. Mary Magdalen on the Mount of Olives, including the sites of the Tombs of the Prophets and (one site of) the grotto of Gethsemane, just up the hill from the Franciscans at the Church of All Nations and the Garden of Gethsemane. Tsar Alexander III acquired the land here in the late nineteenth century, and had the church consecrated in 1888 in memory of his (German) mother, Empress Maria Alexandrovna. The Tsar sent his brother, Grand Duke Segei Alexandrovich and his wife Grand Duchess Elzabeth Fedorovna as the official delegation to the consecration. The Grand Duchess was so taken with the place that, after her husband’s assassination in 1905, she founded the monastic community of Martha and Mary in Moscow. During the Revolution, in 1918, she and her cellmate, Sister Barbara, were taken and thrown into a mine-shaft near Alapayevsk in the Urals. Their bodies were recovered and eventually brought to rest here at the Church of Mary Magdalen in 1921. They were declared martyrs in 1981. The monastic community here owes its origins to two Anglican converts who started the community in 1933. At about the same time, the miraculous icon of the Virgin Mary “Hodigitria” (the Unburnt Bush) arrived at the church. Under previous custody of Metropolitan Ilias of Lebanon, he is said to have dreamt three times that the Blessed Virgin appeared to him, ordering him to give the icon to the care of the Abbess Maria in Palestine. Our visits here included a informative tour by a French brother who was responsible for the guest house and the holy sites. The first of which has been known since the medieval period the Tombs of the Prophets Haggai, Zachariah, and Malachi (d. circa 500 BC). Archaeological research dates the tombs to the first and early second century AD, however. There is evidence of both Jewish and Judeo-Christian burial at the site, and it is in the middle of the massive Jewish cemetery on the Mount of Olives. Both the Franciscans and the Russians have caves believed to be the grotto where the apostles rested as Jesus prayed during his final hours in the Garden before Judas’ betrayal. The Franciscan site is within the cave complex of Mary’s tomb, north of the Garden. The Russian site is uphill, to the east of the Garden. In this, the former was probably an olive press, and the later might make a likelier candidate. Our visit concluded with vespers sung by the nuns, beautifully ‘interrupted’ near the end by the call of the muezzin across the valley, where the Dome of the Rock and Al-Aqsa Mosque were clearly visible form the steps of the church. By A.J. 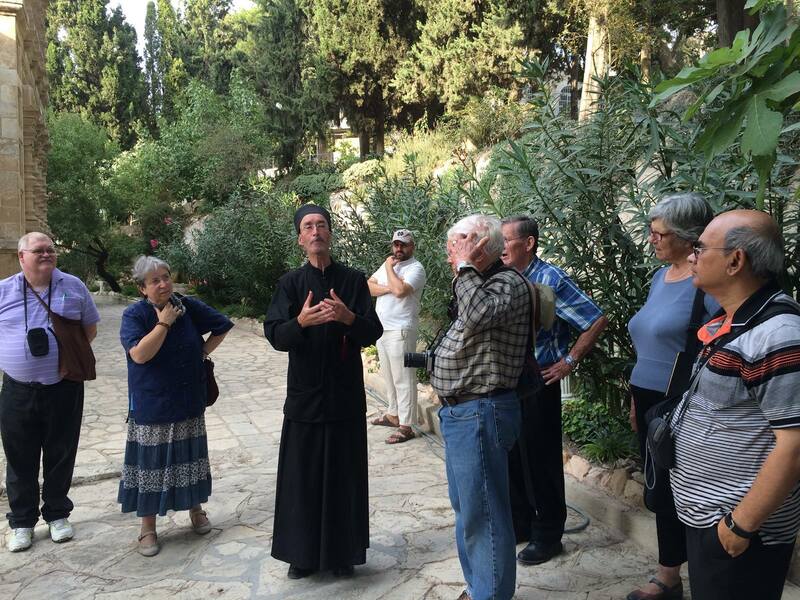 Boyd in Holy Land, Theology and Ecumenism on October 24, 2015 .